As an artist, I've always wanted to have my own website where I could share my art, likes, dislikes, mental processes, formulas and communicate with the people who love what I do. I am getting so close to that dream. I've worked out almost all the details for how my site looks and works. So, I am at the point where all I do is create and share on a daily basis. 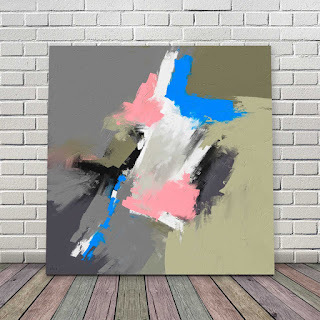 Today, I want to share one of my square abstracts that I have titled Blue and Pink. If you prefer, you can call it Pink and Blue. Blue and Pink is part of an ongoing process of painting an abstract in the confines of a square. If you have never worked in a square format, then you'll probably won't understand why it is a mental exercise as well as painting practice. For me, it is a good way to expand the way I look at things. For this piece, I used one of my favorite apps called Art Set. It has a palette knife tool that simulate a real knife. I like to keep the colors simple and the shapes free of each other but living all in one space. It's much like people. We are all different and have to learn to move and live together. I'm offering it as an Instant-Download-Printable-Artwork $5.95! When you purchase it, you'll be sent to a secure link download site. In the folder, you'll find a PDF with instructions and a very high quality JPEG. Please download them and save on your computer. The image is 36 by 36 inches at 300 DPI. Because it is a square, you can resize it to any size smaller, if you like. Enjoy you new piece of artwork!